During menopause, a number of changes occur in a woman's body. One of the less talked-about changes that may happen is a sudden decrease in the ability to concentrate. This might be linked to changes in hormones, or it could be because of a lack of sleep or another disorder. Whatever the reason, it can cause significant distress in a woman's life, and in severe cases it may need to be treated with medication. There several different types of concentration medications, and not everybody will react in the same way to each of the different options. 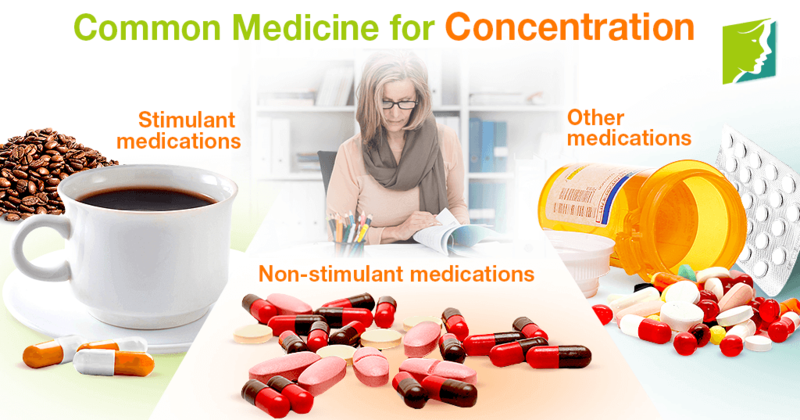 One of the most common categories of medications to help concentration is stimulants. These tend to help the brain focus, concentrate, and remember because they provide a boost to brain functioning by giving the brain a bit more energy. Among the stimulant medications, there are short-acting, intermediate-acting, and long-acting options. Short-acting medications will provide an immediate, noticeable effect, but they are likely to wear off faster and may need to be taken several times a day. Long-acting is the opposite; they will last longer, but will not kick in as quickly. One of the most commonly used stimulants, which does not need a prescription, is caffeine. For women experiencing only slight disruption of their lives because of concentration issues, caffeine is an excellent choice because it requires no prescription and can significantly improve concentration. Another well-known stimulant is Adderall, one of the most common ADD/ADHD prescription medications available. For those whose symptoms are not improved by stimulants or who experience problematic side effects from stimulant medications for concentration, there are also non-stimulant drugs available for use. These tend to have an effect on balancing the necessary neurotransmitters in the brain to help the brain work on increasing focus and concentration. The benefit of non-stimulant medication is that the brain will have improved focus, and the side effects of stimulants, such as restlessness and trouble sleeping, are not an issue with this type of medication for concentration because it has no effect on energy levels. Sometimes, patients don't respond to stimulant or non-stimulant concentration medication. In this case, there are a few other options that may be effective. Most of these options are antidepressants, which affect neurotransmitters as well, but with different methods than non-stimulant concentration medication. Other medications may also be useful for those who are experiencing concentration difficulties due to an underlying condition. Depression, anxiety, and other disorders can make it more likely that a woman will have an issue with concentration. If your difficulty concentrating has become such an intrusive problem that you find yourself suffering in daily life, talk to a doctor about one of these options to figure out how to handle the problem. For more advice on managing concentration difficulty, read about five ways to prevent concentration problems.